Perhaps I had eaten it? If I had, there would be the foil left over. No, there was no foil to be found, either. How strange! As I sat and puzzled over this odd series of events, the absence of the pets was notable. Ah-ha! I leapt from the bed in a flash, and upon entering the living room, saw a dog and cat licking their chops. 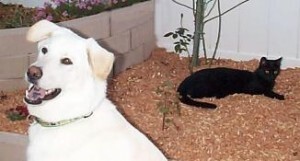 The cat, of course, betrayed no emotions, but the dog was stricken. Guilt was plainly written in his features, but could I act on such thin evidence? The dog often looks guilty for no reason whatsoever. More importantly, how would they have acquired the treat? I could not have failed to notice Le Grand Schnozz making off with such an item. Did I drop it? No, that’s silly – I plainly recall setting it on the nightstand. Again, the lack of foil was mysterious, although I felt the dog more likely to have consumed it than I. The thought briefly crossed my mind to examine the pets for ‘chocolate breath’, but I quickly dismissed the idea. The scene in the living room was already straining credulity by virtue of my lack of clothing. I returned to bed to ponder my next move. Bold action was plainly called for. A plan began to form – a cunning trap to ensnare the nefarious nibblers of my nocturnal noshings… I rose from the bed, and in as casual a manner as I could, declared that I was still hungry! “Those chocolates went down so easily that I certainly have room for another!”, I said. With this, I went to the kitchen, and procured another foil-wrapped delight (I was attempting, of course, to ensure that the circumstances were as close to identical as possible). Retiring to the bedchamber again, I placed the chocolate in as nearly the same position as I could recall, and got into bed. I then picked up my book and began my vigil. I did not have long to wait. The pets came in, perhaps emboldened by their earlier success. The modus operandi was soon to become evident. I focused on my book with all my earthly powers of concentration, and then… from the corner of my eye, I saw it. A tiny black paw, ever so delicate and hesitant, was gliding towards the treat with a single claw extended. “The perfect crime!”, they were no doubt thinking. Suddenly, the claw made contact with the object of it’s desire, and with a deft flick of the wrist, it was gone! Again I leapt from the bed, but this time I blazed triumphant! “J’accuse!! !” I bellowed! Caught in the act, the pair stood transfixed for a moment. “Psssht!” I hissed at the cat. “Out!” I commanded the dog. The effect was satisfactory; the cat fled, leaving the dog to “take the fall”. The dog, no doubt shamed by his involvement, and embarrassed by the feline allegiance, slunk out. I returned to the bed, once again master of the household. Eating the chocolate, I savored it, and observed that as always, vigilance was its own sweet reward.